Natural gas is reliable, versatile, relatively clean burning and efficient. The top five consumers of natural gas in the United States in 2013 were: electric generation, industrial, residential, commercial and vehicle fuel. The majority of natural gas consumed in the United States is produced in the United States. How does natural gas get from the well to your City distribution system? In order for natural gas to meet “pipeline quality” standards, the product may go through many stages of transformation from wellhead to burner tip. Gathering Systems consist of small-diameter, low pressure lines that “gathers” raw gas from the wellhead and moves it to processing plants. Processing Plants removes oil, water, natural gas liquids, and other impurities such as sulfur, helium, nitrogen, hydrogen sulfide and carbon dioxide from the product. Once the natural gas has been through the stages of the processing plants, the product now meets the pipeline quality standards. • Compressor stations – natural gas must be highly pressurized to travel through pipelines. Compression of natural gas is required periodically along the pipeline. • Storage facilities – storing natural gas is primarily used to meet seasonal demand. Most storage gas is purchased and injected into storage facilities during low demand season (summer months) and withdrawn from storage to meet peak demands during the winter season. Underground storage facilities are typically depleted oil or gas fields or salt cavern reservoirs. • Regulator Stations – the pressure of gas moving through the pipe must be reduced prior to moving into smaller lines and distribution systems. Regulator stations are placed along the pipeline to reduce the pressure of the gas to the appropriate operating pressure for each system. 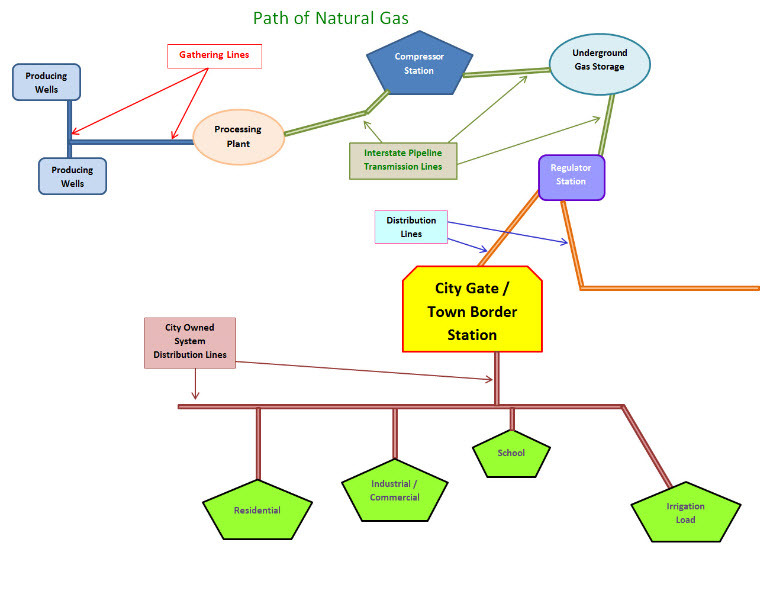 The natural gas moves off of the pipeline into the city distribution system through a Town Border Station (TBS). At the point of the gas transferring from the pipeline into the distribution system, the pipeline will have a volume measurement station in order to know how much volume moved from their pipe into your system. Most measuring stations are equipped with electronic flow measurement (EFM). It is through the city distribution system that gas is delivered to your end-user customers. The diagram below shows the different stages natural gas may move through from the wellhead to your end-use customers.